If you’re dealing with fatigue, you may not have the energy to accomplish all of your daily tasks. That’s okay. 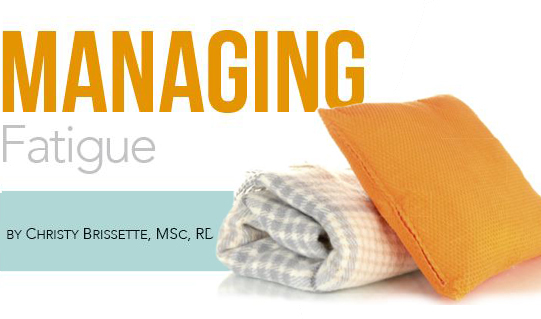 There are two main strategies you can use to help manage fatigue: Save your energy and take steps to reduce fatigue. You may not be able to do as much as you did before cancer treatment. This might mean your house isn’t as clean or you don’t have time to cook from scratch. Be kind to yourself by accepting imperfection. These tasks can wait until you have more energy. Decide what activities need to be done each day and which ones can be delayed. Do the important ones first. Schedule important activities during the times of day when you tend to have more energy. What tasks drain your energy? Let others help you with shopping, cooking, cleaning, gardening or looking after kids or pets. Read our tips in Table 1. Allow time for rest and relaxation. If you start to feel tired, take a break, rest for 15 minutes and go back to your task when you can. Try to limit naps to 20 minutes during the day. Avoid caffeine and alcohol in the afternoon and evening so they don’t affect your sleep. Avoid too much stimulation (physical or mental) before going to bed. Spend time outdoors or doing relaxing activities you enjoy like arts and crafts or listening to music. They can help identify any medical reasons that may be causing or worsening your fatigue. Our tips on pages 4–6 will help you! Research shows that regular exercise is the best strategy to help reduce cancer-related fatigue. 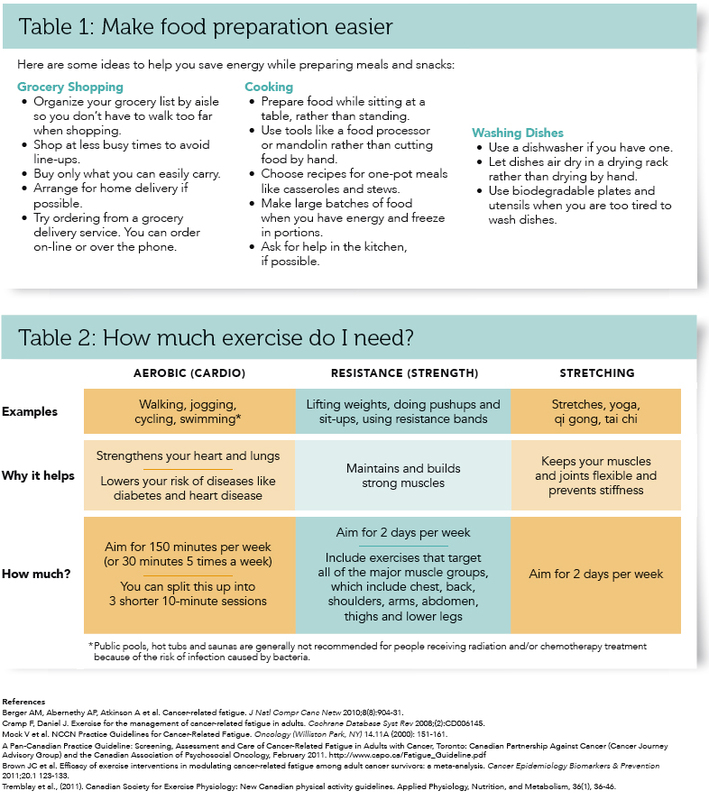 A good exercise program includes 3 types of activity: aerobic, strengthening and stretching (see Table 2). If you are already exercising, try to stay as active as possible during your treatment. You might need to lower the intensity or exercise for shorter periods of time, but some activity is better than no activity. If you haven’t been exercising, start slowly and build up the time and intensity of your physical activity. For example, you may start walking for 5 minutes daily and add a minute each day. Every little bit helps! You may also increase the intensity of your exercise program from light exercise to more moderate effort. Light effort means you can easily carry on a conversation and sing a song while exercising; moderate effort means you are able to talk but not sing without getting out of breath. Talk to your doctor before starting any kind of exercise program. Look for exercise programs designed for cancer patients at hospitals and in your community. Talk to your healthcare team about what is offered in your neighbourhood. Ask your doctor for a referral to see a physiotherapist or other expert in exercise during cancer treatment.